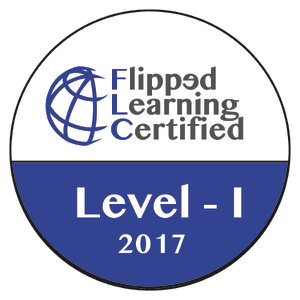 Okay so if flipped learning can be adapted to students on the two tails, or extremes, of the normal curve, and if flipped learning is malleable and effective enough to be customized to various student groups, is there anyone for which flipped learning does not work best? I think that answer is a definitive “yes”. 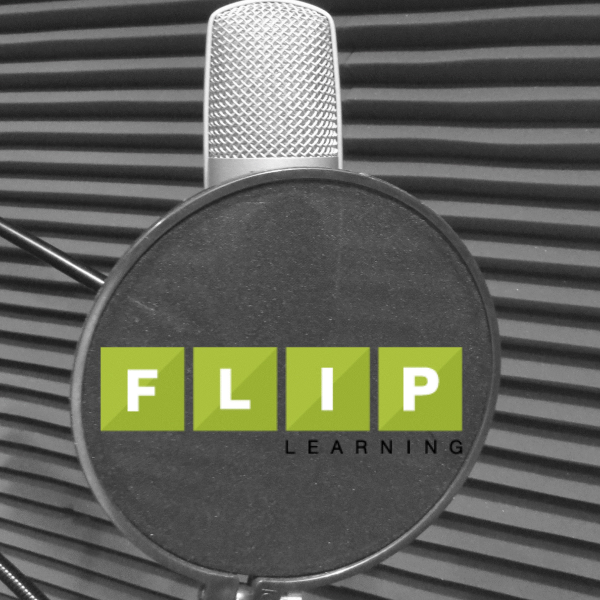 The basic premise of flipped learning is that control and agency is passed from being the sole domain of the teacher between the bells in a classroom to students beyond the bells and beyond the classroom. This is, in fact, what makes it most effective for students with executive functioning challenges as we can remove as educator some of the constraints placed on them by the industrial education model. It removes some of the lockstep limitations for students that are either well above, or well below, the norm allowing them to use their freedom to their own benefit. 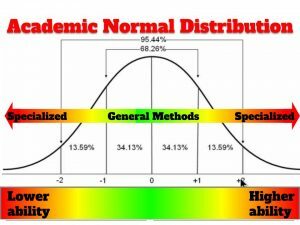 Flipped learning still applies very well to those in the center of the normal curve because students in that largest section of the curve have various preferences, various methods, and various struggles with learning. Again the flexibility and adaptability of flipped learning, when used in conjunction with choice and student control, can address many of these challenges. This is particularly true given the amount of time that it creates in a traditional classroom for things like exploratory learning, hands-on learning, project-based learning, and the like. SO GET TO THE POINT! 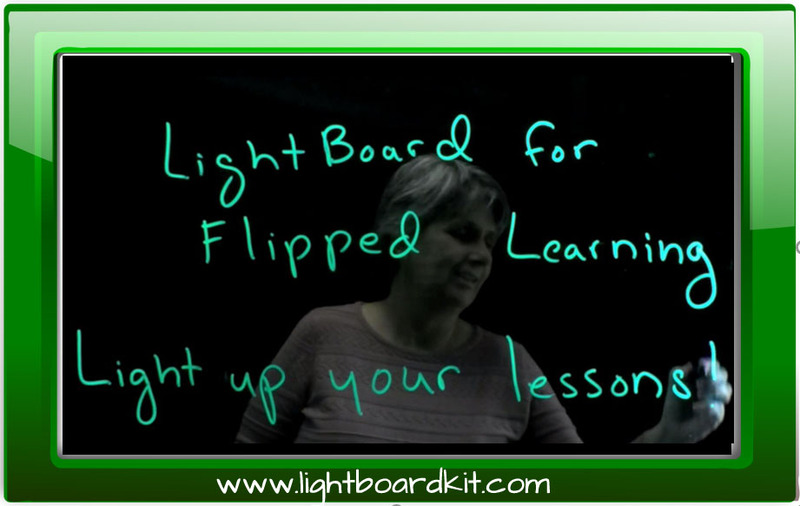 Who does flipped learning NOT work for? Interestingly, flipped Learning works least well with those students for whom the traditional industrial model works most well. The student who through years of educational training has determined that the easiest and best way to get educated is to simply sit like a lump of clay and have the teacher tell them what to do. To be fair, for some students, arguably most students, the direct instruction/industrial method is the most efficient. The efficiency holds as long as communication is direct, concise, and very limited to a specific outcome or skill that is to be practiced and repeated (nee regurgitated). It most broadly fits the model of free education so long sought by so many, yet it comes at a cultural cost in which many believe that the value of the free education is in line with its zero cost. You see we value things based on scarcity and based on perceived quality, this is why we love grandma’s chocolate chip cookies and not Chips Ahoy. We only get grandma’s cookies from time to time, and the amount of butter, sugar, or lard in those cookies would be simply economically impossible for a cookie manufacturer to include at the minimalist price expected by the supermarket consumer. We trade taste for convenience and price. Likewise efficiency in learning normally comes at the cost of quality learning. Quality in-depth learning experiences come with a price based on the necessary ingredients of time, technology, reflection, etc. This cost is far higher than the cultural expectation of an efficient and cheap public education that is priced to the consumer as free. Not surprisingly some students reflect the views of their families or the culture at large and choose the industrialized, mass-produced, low-value, lowest time commitment education model because they simply do not appreciate or desire student-based, differentiated, and richer learning experiences that are available at a greater cost of their own personal time and mental investment. The biggest way to spot this type of learner in your classroom is to simply track who makes the comment ”just tell me how to do it”. Unlike chocolate chip cookies which are universally appealing and nummy nummy, math, science, composition, etc. may not have an inherent draw or perceived value to a given student. For this student, the work of the teacher becomes doubly challenging as we now must provide them instruction and resources for a project they do not wish to have, and have now compounded the challenge by providing that instruction and resource in a method they do not wish to use. To be clear that in no way provides us as educators an excuse for relegating or marginalizing students with this view, as our job is to reach all students. It simply means we need to understand that new methods create a new subsets of students for whom we must come up with new solutions. 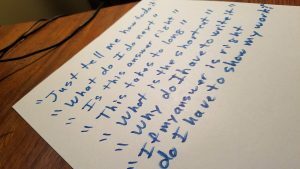 There’s a darker side in the greater cost to the “just tell me how to do it” club because lack of inquiry and lack of curiosity is not the normal state for children. Children from the very earliest ages learn by exploration and mimicry. This is how children learn to speak, how to walk, and how to respond to social cues. It seems to eradicate this curiosity, it requires a vast governmental enterprise that seeks to industrialize and homogenize learning. In the last one hundred and fifty years we have done a tremendous job of creating such a system. To be clear, I’m not simply pointing fingers. We must remember we are a part of that system, and to greater or lesser degrees, we bear at least the tiniest fraction of responsibility for this model’s success. There is hope even among the “tell me how to do it crew” there lies curiosity that can never be truly extinguished. Within those students lies beneficial skills that they have honed to a sharp point that can be redirected for other purposes. While I may never convince a student who’s been told they are bad at math because the industrial education model has labeled them as “a C- student”, that they can indeed excel in some areas of math by using the skills from the other learning silos that they have developed. I may not be able to convince a student whose family or cultural expectation is simply that they “get thru” this prerequisite portion of the free education so they can hurry up and get to the athletic, academic, or religious training that their family more highly desires, that learning how to learn now will benefit them greatly as they specialize in areas they value. 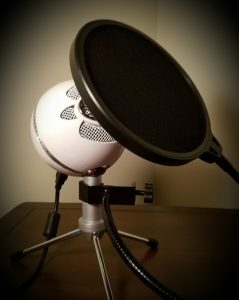 The best I’m going to be able to do for some of the students is to convince them that there are others outside themselves that do learn differently than being told how to do it, and that they too might on accident enjoy learning how to learn to do it rather than me simply telling them. Flipped learning does not work “best” for these students by choice, but by the same token, may indeed provide these students with at least a window into a deeper style of learning, exploration, inquiry, collaboration, discussion and the like. There is no one best way for all methods and all classrooms that addresses the needs of all students. Because flipped learning and the other associated methods a flipped framework makes possible are not normally the social or cultural status quo, there will be a certain small portion for whom the change will appear too great, or not worthwhile. Thankfully, as Dr. Robert Talbert states in his study of flipped research, flipped learning well implemented promises to produce academic results that are “at least as good” as traditional methods, and clearly seems to do no harm. Reluctance on the part of a student, or students, who do not prefer flipped learning does not need to stop us from offering all students a deeper way to learn, and from time to time provide them with the education equivalent of some homemade cookies. I find your article very interesting even though I tend to disagree with it. You are mentioning Robert Talbert and I have a profound respect for his research but I think after reading your articles it present contradiction and a very essential point that is not brought to the surface of your ideas. First of all the essential part of our mission is not to help a student to pass a class nor an exam but it is to help him or her to achieve its highest potential. Second I do agree that for some students, because of so many year of being taught in one way it is more difficult to change especially when research shows that it is in the human nature to save its energy thus to be reluctant to be active. However all research shows that active learning is the best way to improve learning thus achieve your highest potential. We are facing as many challenges that there is student in our class. they all comes with different back ground : social, educational etc…. The only way to be able to respond to them is to be efficient in class to address to each individual the correct strategy. Flip is the key to succeed to that problem. The problem is that Flip many time is not done well and is corrupt by old habit that educator have because they have been educated in a more traditional way themselves. 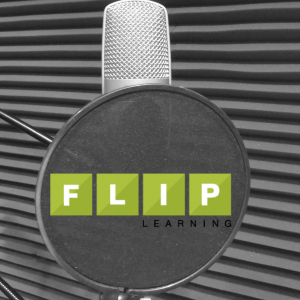 I am convince that Flip can address every student because Flip is Flexible. I will try to publish an article after January to extend my thoughts. Thank you so much for your comments, discourse is a benefit to all. As you suggest the primary message of the Myth #7 blogs (part 1 &2) is that F-L-I-P is flexible and malleable enough to meet a wide variety of needs. You also bring up an excellent point that it is not only prior education training that presents an issue with flip, but poorly implemented flip in the present. 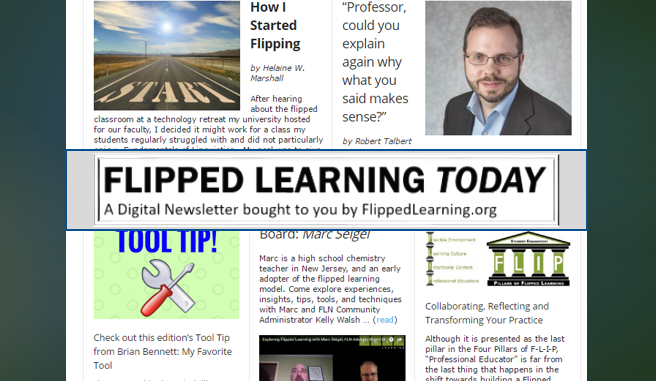 I would go a step further and suggest that there are far more cases of poor tech usage mislabeled as flip without the requisite planning or shifting of classroom control locus that muddy the waters. Sadly there are great definitions available for flip from a variety of sources but regardless responsibility lies with the teacher to become informed and intentional about applying good practice. As to the mission of the educator, I think there is a good deal of consensus that our job is to maximize potential of every student in the ideal world. Unfortunately, most educators function in a public space with the monetary and industrial structure that space implies. Limits on time, budgets, and social expectation will always bring a dose of reality to theory. In part 2 here, the primary discussion was the struggle to do our very best work with students who have a variety of social expectations of public education. While we must continue to convince, cajole, and collaborate there are the realities of students reluctant to buy into their own potential and the benefits of deeper learning. thank you again for your comments, and I look forward to reading your article in January. feel free to share here with the FLN community or even just the link in association with this post.